Sophomore midfielder Brooke Harwood right before a throw in against Fairmont State. (Photo Courtesy of Shepherd University's Athletics Department). At the start of the game, both teams came out with great energy, as Shepherd came into the match with a narrow lead over Fairmont State for third place in the Mountain East Conference standings. Knowing this, the Rams looked to steal a road victory. Rams freshman midfielder Emma Barnardoni put the Falcons defense to the test early on, as she fired off a shot to try to give the Rams an early lead, but junior goalkeeper Shawna Graham of the Falcons was there for the save at the 16:53 mark. Shepherd would put themselves in many positions to score, but just could not capitalize throughout the match. Shepherd took a total of 15 shots with seven on net, while Fairmont took eight shots with three on net. 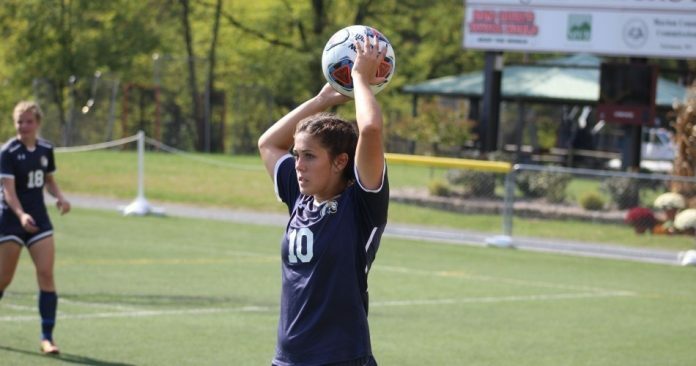 The Rams had more than enough opportunities, as Barnardoni led the team with four shots, while senior midfielder Taylor Hardwood had three shots of her own. In the second half things got chippy, as Fairmont freshman midfielder/forward Louise Welch picked up a yellow card. Four minutes later, Hardwood received a yellow card, as well as freshman defender Katherine Eddy. Shepherd had 17 total fouls on the day, while Fairmont had 13. Both teams’ offensive opportunities took a tremendous hit with these fouls that hindered any progress on the offensive end. Shepherd continued to create looks for themselves in the second half, but just could not put one in the back of the net. It seemed as though they were playing too fast on offense. They needed to slow the game down, which would have made it easier for them. As time expired, the Rams looked disappointed in themselves because they knew how much this game would have helped them out if they won in terms of seeding in the conference. The Rams look to redeem themselves Sunday Oct. 15, when they host Urbana University for the Breast Cancer Awareness/Pink Game. Kickoff is at 3:30 p.m.